Last week, I had a day full of reflections, inspirations, and encouragement. I went to camp, Jewish summer overnight camp, for the annual visit sponsored by Federation and Foundation, to see how our One Happy Camper program, as well as the Jewish Camp Initiative and our national partner, Foundation for Jewish Camp, help bring more kids to this important life experience. On the bus from our Whippany campus out to our first stop, Camp JRF, I shared with the other “day campers” how my two years of experience at Camp Young Judaea helped to form my Jewish identity. I only went for two years, for a total of eight weeks, but barely a day of my life goes by that I don’t think about my time at YJ, or feel its effects on my Judaism, my Zionism and my style of leadership. It was at camp that I first realized that girls could be anything, even in Judaism. Remember, this was way back in the dark ages of 1971 or so, before women in the Conservative movement (which was my background) were rabbis or cantors, or even synagogue presidents, and here were our female counselors, leading Friday night services, serving in the IDF (the exposure to the female tsofim, or Israeli Scouts, was my first encounter with Israelis), and leading Maccabiah. I was never destined to be an athlete of any kind, but more than just being a jock was valued at YJ. I could be valued for being good at doing Jewish – helping with services and programs – and for learning and living Jewish in an informal setting. I found confidence in my Jewish knowledge and belief in myself as a young Jewish woman in eight short weeks at YJ. So, yes, Jewish overnight camp meant a lot to me. And, as I was about to spend the day finding out, it means a lot to other Jewish women, all along the spectrum of Jewish life. We had a fabulous, albeit rainy morning at Camp JRF, the only camp of the Reconstructionist movement in North America. Greater MetroWest is home to several wonderful Reconstructionist congregations; and while Camp JRF welcomes campers from all denominations, it is a place where the values of the movement are lived and reflected all day, every day. We got to visit with some of the Greater MetroWest campers, one of whom, without prompting, said the thing about Camp JRF that meant the most to him was kehillah (community). We’d already heard from Rabbi Isaac Saposnik, the camp director, that this was the ultimate value for Camp JRF. To hear it come unbidden out of this young man’s mouth was amazing. I thought it would be the personal highlight of my visit. I was wrong. Just before we took our group photo, a young woman came bounding up to me. Lily Heyman is a counselor at Camp JRF, and was a member of Diller Teen Cohort 8, which is how I met her last year, when I spoke at one of their gatherings. The Diller Teen program is an intensive national leadership program in which Greater MetroWest participates, funded in part by our Annual Campaign. Diller pairs a group of 20 teens from Greater MetroWest with 20 teens from Rishon Letzion in Israel for an 18 month program of learning, encountering and learning to lead. To read more about the Diller Teen program, click here. Lily was overflowing with enthusiasm and excitement. She told me that it was her experiences as a camper at Camp JRF that made her want to participate in Diller, and that she was bringing everything she learned about leadership in Diller back to her role as a staffer at camp. Lily was so happy to be the counselor for seventh- and eighth-grade girls – she felt she had the opportunity to be a role model for them, and she thought they were just great fun to be with. Now, I’ve been a seventh-grade girl, and I’ve been the mother of a seventh-grade girl, and all I can say is that I am in complete awe of Lily. I told her, just as I had said earlier on the bus, that camp would be an important part of her life, every day, in some way. Good luck at University of Michigan, Lily, and remember that you promised to come back to Greater MetroWest! I hated to leave Camp JRF, there was still so much I wanted to talk to Lily about, but it was also good to be heading to New Jersey Y Camps. On the bus, Dov Ben-Shimon read a heart-felt letter from a mother about her 9-year-old son whose life was transformed this summer through Jewish camp, thanks to a Marian and David Rocker Jewish Camp Scholarship. There was not a dry eye on the bus. Yet another reminder of the unique impact that Jewish camp has on young lives. After a terrific (gluten-free mac ‘n cheese!) lunch at Camp Nah-Jee-Wah— part of the NJY constellation of camps— complete with rousing camp songs and birkat ha-mazon, grace after meals (another thing I learned at camp), we headed up to the science fair at the Dr. Lynne B Harrison Science Center. We were fortunate to have my friend, Dr. Lynne B Harrison, with us as part of the visiting contingent, along with her daughter Judi. Lynne is committed to bringing science, and especially STEM (science, technology, engineering, math) learning, to our Jewish community, here in Greater MetroWest, around the world, and in Israel. This is also the case at NJY Camps, and we got to see the campers in action, presenting their science fair projects. This was not the NJY Science fair, which happened earlier this summer, again thanks to Lynne, but the general science projects covered a wide range of the practical applications of chemistry, physics, human biology, and kinesiology, among others. The campers were eager to tell us, and their fellow campers, about their projects. Many of the kids I spoke with had no prior interest or experience in their subject area, but were enthusiastic now. There were can-crushing demonstrations, catapult tosses to measure, some really gooey stuff made with Borax, and a host of other applied science projects. 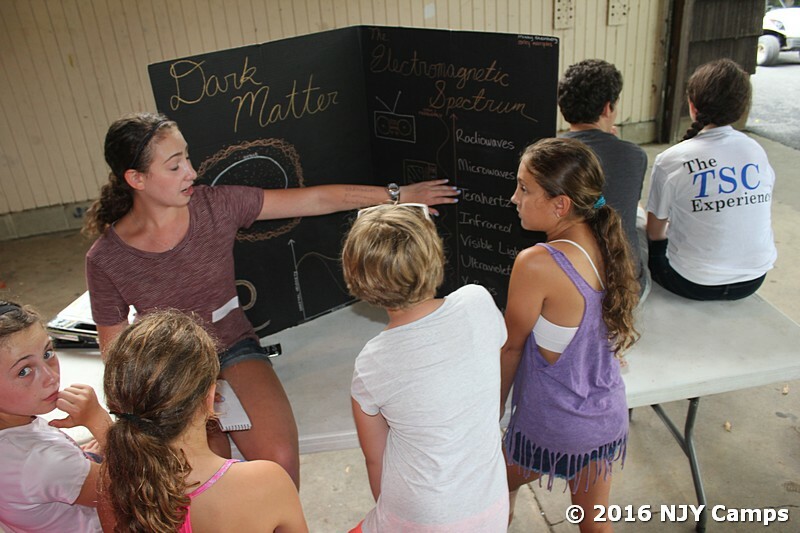 I was captivated by how many stations were being run by girls, and when I got to the booth on “Dark Matter and the Electromagnetic Spectrum,” I was simply floored. Surrounded almost entirely by little girls, a very poised teenager was delivering a clear, understandable, relevant and even humorous talk on this seemingly arcane topic. Shown here is Mikayla Steinberg, 15, from East Brunswick, making her presentation. What really fascinated me was Mikayla’s absolute comfort in speaking about science, with such enthusiasm and in such a sophisticated manner. She didn’t talk down to the kids, she was easy to understand – and I saw her do this presentation three different times, each time with the same grace. I do a lot of public speaking, and this young woman has it all going on. She had a little notebook she referred to from time to time, but to be this good at 15 – I can’t wait to see where she goes next! When Mikayla did her presentation for Lynne, it was a great meeting of two minds. Mikayla was clearly thrilled to meet Lynne, and you could see Lynne’s delight in Mikayla’s knowledge and ability. Because of Lynne’s determination to make science a part of the lives of Jewish kids, especially girls, Mikayla has had this terrific opportunity, one she might otherwise not have had. The photo at right is the picture I will keep in my head from this encounter. Note that Jeremy Fingerman, the CEO of the Foundation for Jewish Camp, was equally taken with Mikayla. It was great to have Jeremy with us, to see all that we do, and to tell us about great new initiatives coming down the pike. I was so proud to know that our community is at the forefront of so much that is happening to support, expand and improve Jewish camp. But truly, the most inspiring moment was yet to come. Like many camps, Nah-Jee-Wah and Cedar Lake, also part of NJY Camps, have an extensive climbing and zip line program. After the science fair, Len Robinson, the irrepressible executive director of NJY Camps, took us to the climbing stations to show us what was happening. What no one anticipated was that Kim Hirsh, our JCF Director of Philanthropic Initiatives, and Paula Gottesman, one of the Federation and Foundation’s leading donors to philanthropic initiatives like One Happy Camper NJ and the entire Jewish Camp Initiative (as well as the Greater MetroWest Day School Initiative), would ride the zip line. Now, Kim is very athletic, and very adventurous. Kim riding the zip line? Fun, brave, but not really surprising. Paula is brave in the face of “it can’t be done” types of communal challenges, but I didn’t know that she was physically brave as well. I’m terrified of heights, and even the thought of climbing up the telephone pole to get to the zip line platform was enough to make me woozy. But up Paula went, demonstrating her characteristic grit and quiet determination. And when she went sailing over our heads, as someone remarked, you could see that she was, indeed, “One Happy Camper.” Paula is the mother of four women who are my contemporaries, and all I can say is that I hope I can grow up to be as brave as Paula, in all of the different ways she has shown us. You can see Paula’s wild ride here. The professionals from our Federation also inspired me that day, and every day. Without Kim, and especially without Tracy Levine, the director of our Jewish Camp Enterprise, including One Happy Camper, none of what I saw would be happening. Although Tracy couldn’t be with us, as she was recovering from a minor illness, every staff person we spoke with at both Camp JRF and at NJY Camps was clear that the Greater MetroWest Jewish community has a real treasure in Tracy. 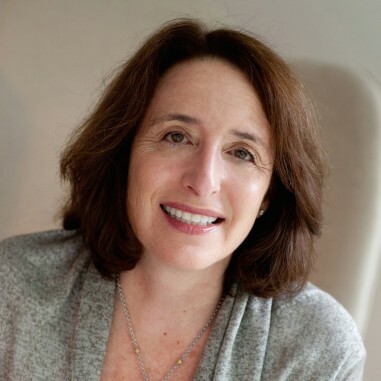 We are grateful for Kim, Tracy, and for Bob Lichtman, our Chief Jewish Learning Officer, whose energy and vision drives our Federation’s work in experiential Jewish life. To be unafraid to tackle new challenges at any age, and to inspire others to do the same, is always a goal of mine. To encounter in one day at camp six different women – Lily, Mikayla, Lynne, Paula, Kim, and Tracy – who are taking on new challenges with open, generous hearts, made it one of my most inspiring days ever as president of this great Federation. We can all use inspiration like this – please join me next year as we take this visit to even greater heights – which does NOT mean I’ll be doing the zip line! To find out more about One Happy Camper, the Greater MetroWest Jewish Camp Enterprise and scholarship opportunities, please visit OneHappyCamperNJ.org or contact Tracy at tlevine@jfedgmw.org. To learn more about how you can help make dreams come true through your philanthropic initiatives, please contact Kim Hirsh, at khirsh@jfedgmw.org. To see all of the other facets of our Federation, please visit www.jfedgmw.org. And please plan on joining me next year for another amazing camp visit!